Blue Hill at Stone Barns is the ultimate locavore dining experience. You can’t get much more local than picking harvesting vegetables and herbs right behind the restaurant or roasting the pig that grazes just a few hundred feet away. The restaurant has no menus, no specials of the day. Your meal is guided by what’s in season and what’s fresh. A welcome “journal” greets you with lists of what’s in season and how the dining experience works. For dinner, you have a choice of 5, 8 or 12 courses. The amount of food is fairly consistent across all three meals. Selecting a higher number of courses is simply a way to try more ingredients and different preparations. I’ve dined at Blue Hill twice. Different seasons, different company, different experiences completely. Dinner one was in the fall, for my birthday, a few years back. It was an intimate meal for two, just my husband (then fiancé) and me. He tried to surprise me, an extremely difficult task. I was told to pack for the weekend and my birthday card included a printout of a rustic barn. He was trying to be mysterious, but it was a photo I knew well. 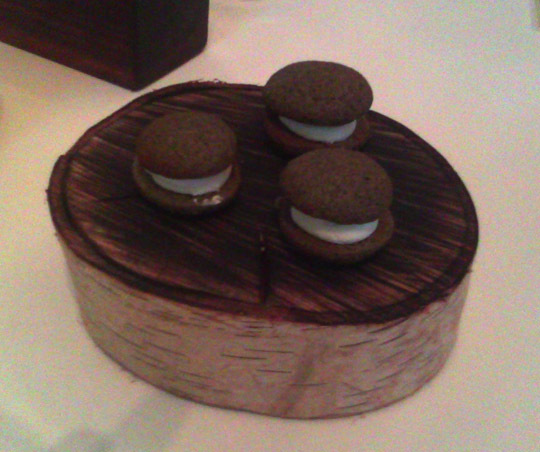 I had been dreaming of the day we could one day dine at Blue Hill at Stone Barns. I knew instantly, though tried to play along. We arrived at the restaurant about 15 minutes early to enjoy a drink at the bar. Defiant’s Triple was on tap, not only a great beer but from a brewery run by good friends of ours just across the Tappan Zee Bridge in Pearl River. We were seated a few minutes after our reservation time. Apologies were made for the delay and our beers were comped. I’ve been seated half an hour past a reservation time at other restaurants without even an “I’m sorry”. The gesture did not go unnoticed. I was a bit anxious of the meal at first. When the waiter approached us about dietary issues (none), likes and dislikes, my husband said, “Challenge us.” We sampled roasted vegetables, warm soups, cheeses and crackers for nearly a half an hour before the sommelier approached us. We were considering a bottle but were not certain where we were in our 8 course meal. He looked at us curiously. “I don’t think you’ve had any courses yet”. The parade of food that had been filling us was only a variety of amuse-bouches. I set down the morsels, afraid I would be full before even the first course. It was truly the dinner of a lifetime. Challenged we were, our culinary world exploding. I wish I could remember every detail of the meal, but it was nearly 5 years ago. There was a barely cooked frothy egg, served in a sea urchin shell. The most intensely flavored, tender pork loin I’ve ever tasted (though it was a bit awkward to visit the pig pen the next afternoon and confess that we just ate one of their friends). We dined on sheep’s brain—apparently rare in the kitchen and not served to the faint of heart. I was hesitant but pleasantly surprised. It was light and buttery, barely seasoned. I don’t know if it is a dish I’d want to enjoy daily. But it was certainly a treat and a dish I will remember forever. Dessert was rich and chocolaty. Only in my mid 20s I had eaten the meal of my life. Could anything ever really top it? Having such an amazing experience, we urged others to visit. Finally last August we went with my husband’s family to celebrate both his and his mother’s birthdays. With 6 diners, the meal wasn’t nearly as intimate, though the serve was still spot on. Before you could even think of something you needed, a server was there by your side. The meal was spectacular but in a different way. Among the group was a hefty list of dietary restrictions—no fish, no pork, no heavy cream. One of the advantages of Blue Hill’s experienced kitchen is that every diner does not have to have the same dish. While still enjoying the same amount of courses, the person beside you could be enjoying a completely different dining experience. Though this was explained, I still felt plates were conceived mostly around the dietary restrictions (it affected 3 of the 6) and the rest of us missed out from more adventurous experiences just a bit. We opted again for the 8 course tasting menu, this time with wine parings. When it was just my husband and I, we dined late and had to navigate the windy roads of Westchester back to our B&B. We figured splitting a bottle was safer. But this meal was carefully planned. Earlier in the day and plenty of time to relax before someone had to get behind the wheel. While I was excited to see a number of New York wines included in the pairings, I was pretty familiar with a number of the selections. The pairings weren’t as spot on as a meal at Telepan and I’m not sure it was really worth the $110 per person charge. Next time I think I would rather opt for a few good bottles instead. During our first visit the sommelier was extremely helpful in picking a bottle within our price range (around $100) that paired well with the majority of our courses. Late August is near the peak of the Northeast’s harvest. Rightfully so, the meal celebrated the harvest and featured a number of vegetarian courses. 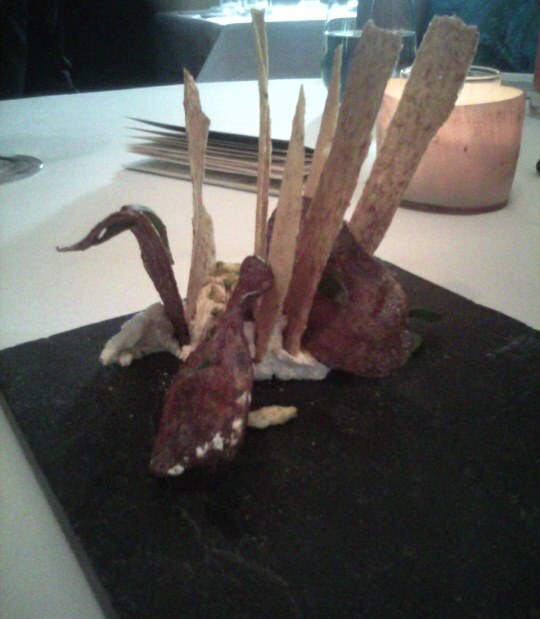 As in our first experience the amuse-bouches flowed freely. Grilled onion and mint whoopie pies, fresh crisp veggies, and goat cheese with purple potato crisps and polenta. It of course wouldn’t be fair to share with you all the courses. You would be left hungry and jealous because with Blue Hill not having a real menu, who knows if you could ever even get these magical food creations again? Instead, let’s just talk about some of my favorites. 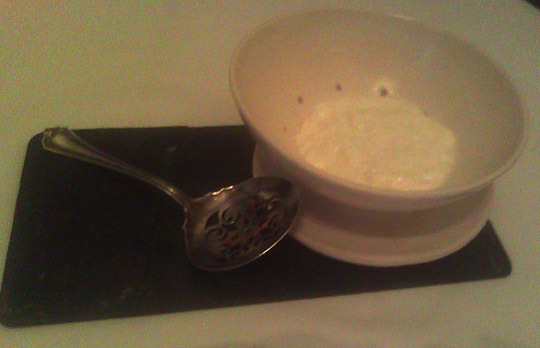 I adored the presentation of a pot of fresh ricotta curds, served with Swiss chard marmalade and buttery brioche. 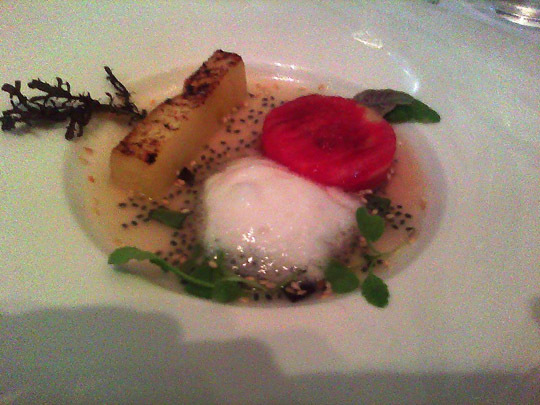 Then there grilled melon with tomatoes and citrus foam. Our only meat course was a tender cut of grass fed beef with shelled cranberry beans. I was perfectly satisfied with the portion (we tend not to eat that much meat anymore) but a few of our big meat eaters were a bit disappointed. I was sad not to get another taste of Blue Hill’s fantastic pork. Or a seafood course. I credit that to the dietary restrictions of our table. To be honest, I felt a bit let down after our second meal. Sure, it wasn’t prefaced with the “challenge me” goal and we did have some dietary restrictions, but it felt more grounded than the original fantasy meal we experienced. And it did leave me with some regret. We talked for years about Blue Hill to family, and when finally convincing them to go, we ended up with just another great meal. It was lacking that extra wow factor we hoped to share with them. In the future I would save Blue Hill for a more intimate occasion. Certainly visiting for the first time made the meal more special, but I think dining with a party of two gave us more to experience. We had no restrictions and more time to share and talk. As with any larger group, great company is appreciated, but conversations often digress from the meal itself. It’s not a bad thing at all, but Blue Hill is someplace you want to be completely focused on the meal to make sure you’re taking away as much as you can. Reservations are necessary and in high demand. For a weekend reservation, plan on booking six weeks out (especially with a larger group), unless you’re okay with dining at 10pm. Both meals I’ve gone with the 8 course menu. It’s a nice balance, right in the middle with six savory and two sweet courses. I would suggest the same or perhaps splurge for the 12 course. Blue Hill is certainly a once (or twice) in a lifetime restaurant (at least for my budget), so if you have the chance, why not splurge? I would opt for more courses over the wine pairing and just settle on a bottle or two of good wine. Make friends with the sommelier; he is a great guide. From New York, Blue Hill at Stone Barns is just a 45 minute train ride from Grand Central and a quick cab ride away. For those of you scared to leave the city, be sure to visit Blue Hill in the Village—a completely different dining experience but equally as special. What a beautiful place, I had heard blue hill had a place in the city but never tried. I am really enjoying your reviews, reminding me of restaurants I have wanted to try. I have been dying to get here. I live close too. After reading this I want to go even more. It is really amazing, but a splurge. They also do lunch/brunch that I think is a lot more reasonable. I’ve never gone but have friends who live closer and loved it. So, so jealous! I’ll make it up there one day, I’m sure. I highly suggest going up in late Fall for the weekend. Sleepy Hollow is just 15 minutes away and they have a lot of Halloween activities including the great jack-o-lantern blaze (go to the later session if you’re childless). Plus apple picking and hiking are pretty close by.